Bloomfield Hills, the neighbor to West Bloomfield, is considered to be one of the nicest places to live in Michigan. It’s known for its large secluded homes that offer its residents a peaceful and private home life. Bloomfield Hills was originally a farm town until the turn of the 20th century when a group of wealthy Detroit residents purchased the land and eventually voted to become a city to avoid being assimilated into Birmingham. Today, Bloomfield Hills consistently ranks as one of the top five wealthiest cities in America that consists of more than 1,000 households. 39 percent of those households are valued at over $1,000,000. Because of the seclusive options for majestic homes in Bloomfield Hills, many notable people have lived or continue to live there. Some of the notable people include Robin Williams, Gordie Howe, Steve Yzerman, Mitt Romney, Lee Iacocca, and Roger Penske. Bloomfield hills is certainly a wonderful place to live for those looking for a comfortable place to call home. For more information about the area, please visit the City of Bloomfield Hills website here. 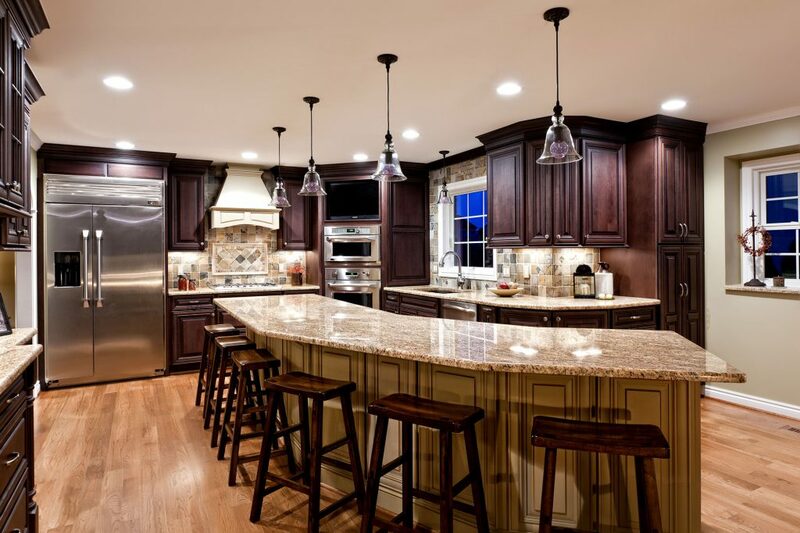 The above picture shows a large two-toned Bloomfield Hills style kitchen remodel with dark stained cherry cabinets and a large painted island. A wall was removed to make room for extra seating at the new island. The next picture is a large red Bloomfield hills style bathroom remodel. We tore out the old cabinets, tub, shower, and floor. We then installed all new materials, added a tile backsplash, and painted the walls red. 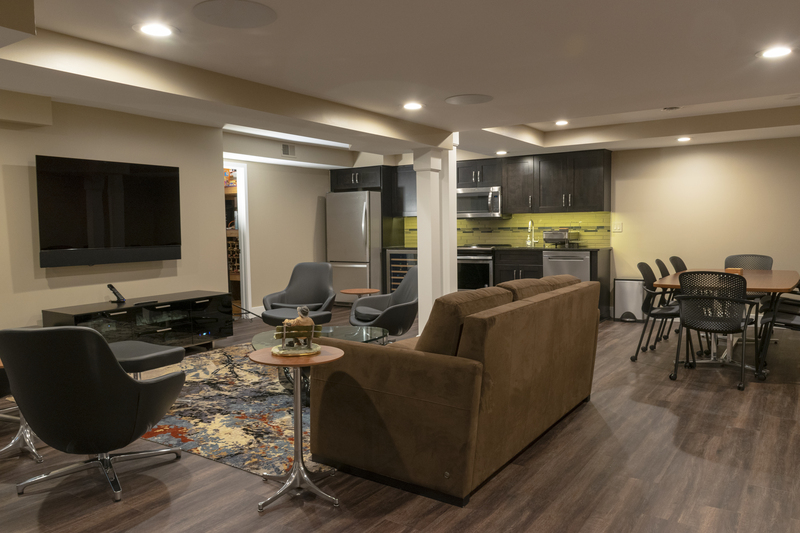 The following picture features a wonderful basement remodeling project in Bloomfield Hills. It features an entertainment area, new kitchen and new bathroom. We also have a video with the customer review including before pictures. It is a great page to visit to see and listen to all aspects of the remodeling process. “We have worked with Ron Jedwab and Lincorp on a number of home renovation projects from 2002 — 2007. During that time, we have been extremely satisfied with both cost and quality, as well as Ron’s integrity. Ron excels at project management and the orchestration of his sub-contractors, ensuring that everything falls into place in a timely manner. Unlike other contractors that we have worked with, Lincorp’s trade’s people arrive at the times when they scheduled to arrive, and if, for any reason, there is a problem, Ron has incredible follow through and a great sense of urgency. He clearly understands a homeowner concerns and frustrations. Working with Lincorp, we never have to worry about loose ends. 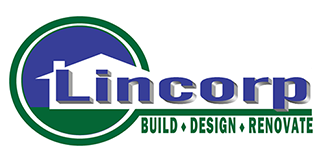 In fact, we used Lincorp’s services to help us when we needed a new roof. We could have found a roofing company on our own through friends, but we knew that if a problem arose over time, we could always call Ron, and he would take care of it. Having had a problem in the past with shady workmanship and tradesman disappearing, engaging Lincorp for this purpose gave us the added security of knowing we always had someone to call if a problem occurred after the work was completed.